Where Were You 20 Years Ago Wireless-Super-Nintendo-Controller-Mod? Before the advent of wireless controllers video game consoles were built like tanks to survive the countless times they'd be inevitably yanked to the ground when someone tripped over a cable. If only the wireless technology needed for this hack existed twenty years ago. The mod isn't for the hacking feint of heart. You'll need to do a lot of fitting, wiring, and soldering work on a Super Nintendo controller to get all the components squeezed inside. Including the addition of a power switch, emitter, and an LED power indicator. 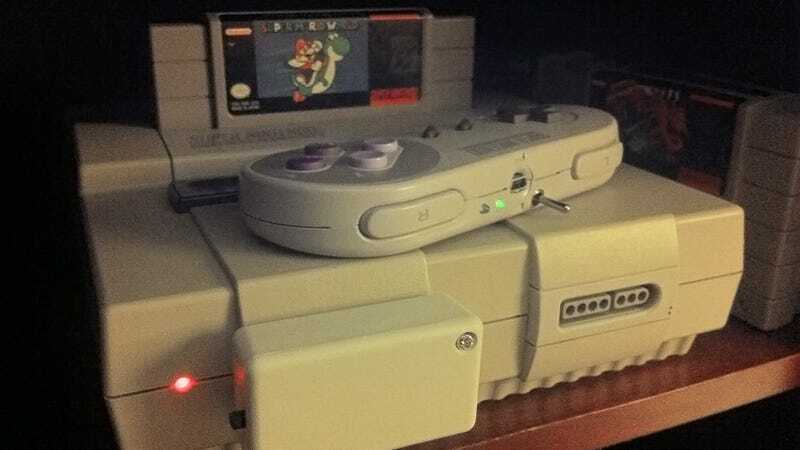 But the effort is totally worth it for the handful of persons who still keep a functioning SNES hooked up to a TV instead of using the Virtual Console on the Wii.